Library Tales Publishing, 9780692480205, 434pp. 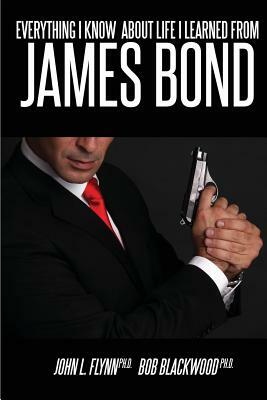 Everything I Know About Life I Learned From James Bond by John Flynn and Bob Blackwood is a light-hearted but thoroughly researched look into the world of James Bond. For the adolescent male growing up in the 1950s and 1960s, 007 was everything that young men were not. He was sexually irresistible to women. He was well dressed and well groomed, socially astute, clever and witty, athletic, debonair, dangerous, and heroic. He drove the coolest cars, possessed the greatest gadgets, traveled to the most exotic places, made love to the most beautiful women, and had the most fun of any cinematic hero. James Bond represented everything that authors John and Bob wanted to be. And now, as they look back over the years as middle-aged adults and college professors, both realize how much Bond helped re-define their understanding of what it meant to be manly, particularly at a time in our culture when the roles of men and women were becoming so fractured and confused. This book provides witty and insightful aphorisms about everyday things, ranging from girls to food and drink, cars to clothing and style, and life lessons to fun facts about culture and civilization, as reflected through the prism of James Bond, the world's most stylish and cultured secret agent.